Amtrak is planning a $1.5 billion, six-span bridge to replace the Portal North Bridge over the Hackensack River in New Jersey. With thousands of their bridges aging and deteriorating each year, railroads keep working to ensure the heavily used structures are safe and sound. For BNSF Railway Co., that means inspecting about 13,000 bridges network-wide at least twice a year. Typically, the railroad completes more than 60,000 inspections each year of steel, concrete and timber bridges. In addition to visual inspections, bridges are analyzed with special vehicles and unmanned aerial vehicles, or by divers if any portion of a foundation is underwater, said Craig Rasmussen, BNSF’s assistant vice president of engineering services and structures, in an email. A bridge’s age is one important aspect. But that isn’t a primary factor to determine whether to replace a bridge, said Union Pacific Railroad Assistant Vice President of Engineering Construction Jeff Mancuso. No matter the causes, a lot of bridges continue to be upgraded or replaced. And some railroads are taking a new approach to those efforts, while others stick with the tried and true. Following are a few such projects either recently carried out or proposed by two Class Is, Amtrak, a short line and a commuter railroad. The 112-year-old San Bernard Bridge near Sweeny, Texas, in UP’s Angleton Subdivision had undergone numerous temporary repairs in 2017. But increasing demand for 286,000-pound track-weight standards and intermittent service issues meant a full replacement was warranted. Yet, relying on conventional construction methods to replace the 614-foot-long, three-span steel bridge would mean numerous track outages to complete the work. And on average, 19 UP trains crossed the bridge each day. So, UP officials sought an alternative. The solution: constructing the entire bridge offline, then installing it during a short time window. 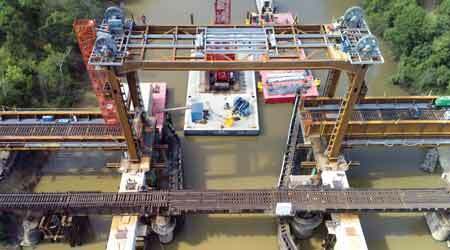 Although it isn’t uncommon to build spans offline during bridge construction, the concept of sliding a complete movable bridge into place during one outage had never been attempted before in the rail industry — at least not to anyone’s knowledge at the Class I, said UP’s Mancuso. Union Pacific Railroad would have needed a month or more instead of a week to replace the San Bernard Bridge if the Class I hadn’t relied on a new offline construction technique. Discussions about the bridge replacement began in 2014. Early on, project constituents talked about replacing the bridge with another swing span and raising the tracks 20 feet so a standard bridge could be installed. In 2015, they opted to build a lift-span bridge due to economy and fewer service disruptions, then decided to construct it entirely offline. The offline idea needed time to flesh out. “We needed to go from a conceptual idea to a workable model,” said Mancuso. Some minor prep work began in December 2016 and carried over into 2017. The bridge span was swapped out in summer 2018 during an 80-hour track outage. The bridge closed for the installation work July 6 and reopened July 9. A few days later, all remaining electrical, signal, communication and mechanical components were completed, then the bridge was reopened to river traffic. If UP had used conventional methods to replace the bridge, there would have been about 12 track outages and it would have taken a month or more to complete the project, said Mancuso. Now, the Class I knows the concept works well and can be applied in the future, he said. Among the project challenges that were overcome: minimizing impacts to both rail and marine traffic, and physically moving the bridge into place in just three days. BNSF currently is working with the U.S. Coast Guard to solicit feedback from the maritime community about a proposed design of a new Salmon Bay Bridge in Seattle. 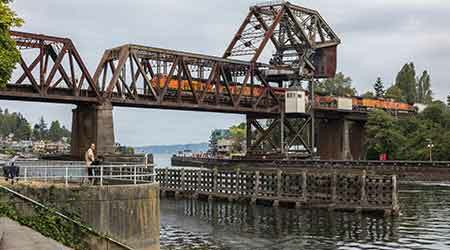 The bridge is 104 years old and needs to be replaced, BNSF officials say. The counterweight truss is showing signs of fatigue and the trunnion bearings are wearing out, which could cause the bridge to get stuck in the “up” position, and there’s no alternate train route available in the area. Although the existing structure is a bascule bridge, BNSF is proposing a vertical lift span that would be about 450 long, and have 155 feet of vertical clearance and 250 feet of horizontal clearance. The maritime community’s input will help ensure the vertical clearance meets current and future vessel needs. A vertical lift bridge has distinct advantages, especially for heavy-rail use, said BNSF’s Rasmussen. The Salmon Bay Bridge in Seattle is 104 years old and is showing signs of age. BNSF anticipates submitting permit applications in early 2019. It will take about two years to obtain permitting, three years to complete construction and additional time to demolish the old bridge. The earliest the new bridge could be operational would be in 2023, Rasmussen estimates. BNSF officials are examining potential impacts to other bridge users once construction starts. When Hurricane Sandy struck the East Coast in 2012, lots of rail infrastructure was damaged or destroyed. Count Amtrak’s Spuyten Duyvil Bridge in the New York City area among the former. The more than century-old railroad swing bridge spans Spuyten Duyvil Creek between Manhattan and the Bronx, and provides train access between upstate New York and New York Penn Station. The storm caused much corrosion and accelerated wear and tear on the bridge’s mechanical and electrical equipment, which date back to the 1980s and 1990s, said Amtrak spokesman Jason Abrams. So Amtrak used Hurricane Sandy recovery funds to in part repair the equipment. The Spuyten Duyvil Bridge work was performed last year with track 19 improvements and an Empire Tunnel connection, said Abrams. All three projects cost a combined $45 million to $50 million. On June 14, 2018, crews removed the bridge from the creek to start the repair work. In order to move the bridge, they used the “Left Coast Lifter,” one of the world’s largest floating cranes. The crane weighs more than 1 million pounds, said Abrams. To peform work on the Spuyten Duyvil Bridge, crews used the Left Coast Lifter, a floating crane that weighs more than 1 million pounds. All work was performed by a mix of Amtrak’s own forces and subcontractors. To repair the mechanical equipment, crews replaced the sensor bearing that helps turn the bridge. They also replaced all motors and copper wiring under track. The project lasted from late May to early September. Weather proved to be a challenge, said Abrams. Meanwhile, Amtrak continues to plan a replacement of the more than 110-year-old Portal North Bridge, a two-track, swing-span structure over the Hackensack River in Kearney and Secaucus, New Jersey. 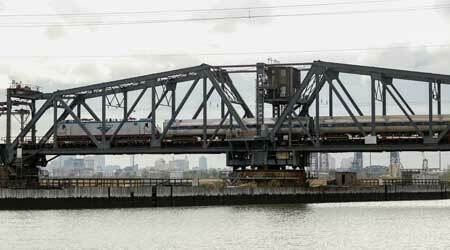 The bridge often malfunctions, causing transit delays on the busy Northeast Corridor. “It’s about 23 feet above water and rotates to open for marine traffic. It has not worked properly more frequently than we’d like, and causes massive delays to trains,” said Amtrak spokesman Craig Schulz. Amtrak plans to replace it with a new 50-foot, high-level, fixed-span bridge that can accommodate faster trip times and boost reliability. The $1.5 billion, six-span bridge will not open and close like a movable bridge, said Schulz. The bridge replacement is part of Amtrak’s Gateway program, which involves a series of projects aimed at doubling rail capacity between New York and New Jersey, and improving resiliency. The new Portal North Bridge and a Hudson Tunnel project comprise the program’s first phase. The new bridge will be built to the north of the existing structure, which eventually will be dismantled. The new bridge will feature 10 percent more capacity. The project has a five-year construction schedule and the bridge has been designed, said Schulz. Amtrak has collected half of project costs from local partners and applied to the Federal Transit Administration (FTA) for a core capital program grant. The railroad is awaiting the FTA’s review. For now, Amtrak has performed some early work for the project. At some point, the railroad also expects to replace the Portal South Bridge with a comparable structure, said Schulz. The Terminal Railroad Association of St. Louis (TRRA) is pursuing a replacement of the nearly 130-year-old Merchants Rail Bridge, which spans the Mississippi River between St. Louis, Missouri, and Venice, Illinois. 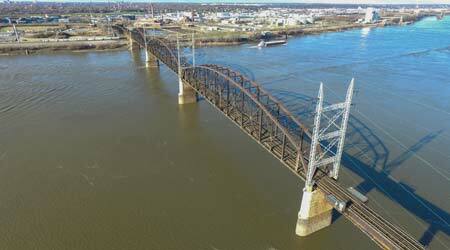 The heavily used Merchants Bridge over the Mississippi River is the sixth-busiest rail bridge along the major river. Owned by TRRA, the bridge is heavily used by Amtrak and six Class Is: BNSF, CN, CSX, Kansas City Southern, Norfolk Southern Railway and UP. The sixth-busiest rail bridge along the river, it serves the nation’s third-largest rail hub. TRRA has sought a $220 million replacement the past several years because the bridge has speed, clearance and weight restrictions that impede the region’s busy rail operations. The Merchants Bridge has an operational capacity of 38 train crossings per day and now averages 32, while TRRA’s nearby MacArthur Bridge has an operational capacity of 72 train crossings per day and currently averages 40. Train traffic in the region is expected to greatly increase over the next 20 years. The U.S. Department of Transportation (USDOT) projects a 49 percent boost in rail tonnage nationwide by 2040 and Amtrak forecasts a jump in its daily trains in the area from 10 to 22, said TRRA Chief Legal Officer and Director of Corporate Affairs Asim Raza in an email. A new Merchants Bridge would double the structure’s train-crossing capacity from 38 to 76 per day, he said. For now, clearance issues prevent two trains from crossing the bridge simultaneously, so the structure is limited to one-track operations, causing many trains to stop on or near the approach grades. Plus, the bridge can’t adequately accommodate 315,000-pound locomotives and 286,000-pound rail cars. A new Merchants Bridge could accommodate speeds of 20 mph for freight trains and 30 mph for passenger trains; most trains currently cross the bridge at only 5 mph. TRRA last year sought a $75 million Fostering Advancements In Shipping And Transportation For The Long-Term Achievement Of National Efficiencies (FASTLANE) grant from the USDOT to help fund the project, but its application was denied. The association likely will apply again in the next available round of federal funding for fiscal-year 2019, said Raza. “We believe this project aligns well with the goals of the USDOT and its Infrastructure for Rebuilding America, or INFRA grant program,” he said. In the meantime, TRRA decided to proceed with the project without federal funding aid because of the bridge’s deteriorating condition. The association has lined up Walsh Construction Co. of Chicago as the contractor and obtained a construction loan from the Bank of America. TRRA plans to assess usage fees to users of the new bridge to help cover the financing and recover loan expenses. Association officials are awaiting final project permitting from the U.S. Army Corps of Engineers, which is anticipated in March, said Raza. Major construction would start immediately after and the project is estimated to take about three to four years to complete. The new double-track bridge will be built via accelerated construction techniques to replace the three 518-foot main spans. Trusses will be built to the south of the existing bridge and will be floated in during a 10-day rail bridge/three-day river barge outage for each of the three spans. The heavy utilization of the river and 50-foot variations in water levels at the location likely will pose substantial hurdles after construction starts, said Raza. 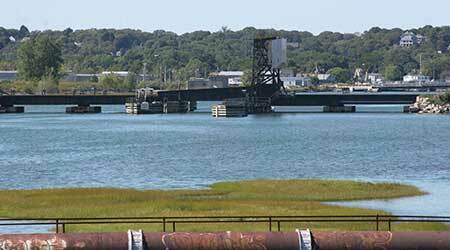 A drawbridge over the Saugus River on the Newburyport/Rockport Line has served the Massachusetts Bay Transportation Authority (MBTA) well for more than a century. But its condition continues to deteriorate despite many repairs over the years. So, the agency is pursuing a replacement. In May 2018, MBTA’s board awarded a $7 million contract to Hardesty & Hanover LLC to design a new drawbridge. The proposed bridge — which is projected to last up to 75 years — will feature two tracks. The draw span will be a rolling lift “Scherzer-style” bascule span while the approach spans will be through-girder spans with reinforced concrete-ballasted decks. Scherzer-style refers to the rolling lift trunnion that raises the span by rolling on a track resembling a rocking-chair base. A drawbridge over the Saugus River continues to deteriorate despite many repairs over the years. The rolling lift-style bascule is an economical choice for a movable span when construction is unaffected by the existing bridge or rail operations, according to the MBTA. The authority is vetting design options now and the $100 million project is in the environmental phase, said MBTA Senior Project Manager Brad Nicoll. “We’re essentially looking at three options: a hybrid with some replacement and some retrofit; an online alignment replacement; or to build it to the southeast as an offline alignment,” he said. The preferred alternative is the last one, which would enable the MBTA to minimize service impacts during construction, said Nicoll. The design work and environmental study is a two-year process, and the MBTA is a year away from an environmental filing, he said. 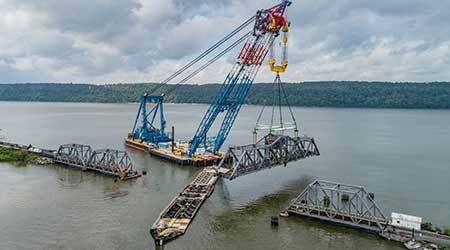 Upgrading the resiliency and reliability of the bridge is key, Nicoll added. The vertical-lift bridge opens about 1,500 times a year because there is lots of marine traffic on the river. Per the preferred alternative, the MBTA plans to increase the span lengths and have fewer spans on the new bridge. The current 480-foot bridge has nine spans (eight approach and one main/draw span) while the new 530-foot bridge would have five spans (four approach and one main/draw span). Fewer spans means there are fewer foundation elements in the water, reducing the cost and risk those components bring to a bridge project, said Nicoll. The MBTA plans to advertise for a contractor in late 2020 or early 2021 and start work in 2021. The project is projected to take three-plus years to complete.